"91 percent of American adults surveyed believe in God—and nearly half reject the theory of evolution"
"Putin hands Chechnya to his ‘little Saddam’"
Any "revolution" that gets its name from the pen of a US State Department's bureaucrat is 1) not a revolution; 2) a movement that will push the country into the brink of a civil war. "Rival rallies in Ukraine political fight"
Arabs-on-a-rope. Let me ask it again, where do they find those Arabs who write in US newspapers? This Alia Ibrahim has a silly article on Hizbullah in the Washington Post. Nothing new or original beyond what the March 14th camp is saying in Lebanon on a daily basis. Her thesis, of the notion of Taklif as the determinant of the power of Hizbullah among Shi`ites is more silly than her style. And the article uses cyclical arguments: this is like saying that Mr. Bush is popular among Republicans because he is...Republican. And Hizbullah members don't all follow Khamenei as "object of emulation." First, Taklif has been in place during the era of Subhi Tufayli: so why was the party not as powerful then? The answer to those questions, and to Hizbullah's popularity, can be found not in this idea or that but in the sectarian politics of Lebanon--and in other historical factors. Yes, Hasan Nasrallah has the power to command loyalty in the Shi`ite community, as does Jumblat among Druzes, and mini-Hariri among Sunnis, unless there is also taklif among Sunnis and Druzes too. And then she says this: ""Taklif's use as a political tool has become almost like a military order, and it completely contradicts the individual's sacred right of choice. Nothing should be imposed on people," says Hani Fahs, a cleric and member of the Shiite Higher Council, citing a verse from the Koran: "How can you enslave people, born free by their mothers?"" First, any Arab correspondent who can't recognize a Qur'anic verse is clearly lacking in Arabic and Islamic education. This is NOT a Qur'anic verse, but a saying attributed to `Umar Ibn Al-Khattab. As for Hani Fahs: search this site to learn about his background. He is one of many Sunni and Shi`ite clerics who is willing to offer fatwawawas for a...fee. "Fatah has established a new security apparatus in the Gaza Strip and is recruiting thousands of militants in preparation for another round of violent clashes with Hamas. So far the organization - known as the Special Force - has recruited 1,400 combatants, a thousand of which have undergone military training...Palestinian sources say some 350 combatants from the Special Force were sent to Egypt at the beginning of March to participate in a training course under the tutelage of officers from the Palestinian Authority and Egyptian army." "This 1511 painting in the Metropolitan Museum of Art's exhibition shows the reception of Venetian ambassadors in Damascus." "A high-level al-Qaeda suspect who was in CIA custody for more than four years has alleged that his American captors tortured him into making false confessions about terrorist attacks in the Middle East, according to newly released Pentagon transcripts of a March 14 military tribunal hearing here." "These instructed that party members should not allow themselves to be distracted by charity work but rather that they form "Fighting organizations for seizing control of the state, for the overthrow of government and the establishment of the workers' dictatorship."" "The leader of the U.S. House of Representatives, Speaker Nancy Pelosi, toured Jerusalem holy sites Saturday alongside a congressional delegation that included Democratic Rep. Keith Ellison, the first Muslim elected to Congress." "The Israel Factor: Panel looks more favorably on Obama"
"'I wrote John Paul II's name and I was cured'" (Please sister. Try to write his name again; see if he can cure you of your delusions and hallucinations). A rare wise statement by a US Senator: "“Iraq belongs to the 25 million Iraqis who live there. It doesn’t belong to the United States. Iraq is not a prize to be won or lost.”"
"Mr. Nusseibeh is really an Israeli dream." Who can disagree with that? But then Bonner says: "Such refreshing self-deprecation — rare in Arab public writing..." How would you know when you don't know Arabic? Or did you hear that on good authority? Mr. Hariri Propagandist: The Tale of the Kind Billionaire who allowed his bodyguard to kiss his hand. I finished reading Nicholas Blanford's Killing Mr. Lebanon. I am reviewing a couple of books on Lebanon for an academic journal. Are you kidding me? When I finished reading it on the plane, I felt that I owe an apology to Hariri propagandists Farish Khashshan and Brent Sadler. Where do I begin. You can read my review elsewhere, but this is quite unbelievable. It is an official Hariri biography and "research" is solely interviews with Hariri entourage, and he no more than repeats the gossips, rumors, and innuendos that are contained in the vulgar and crude columns of official Hariri propagandist, Farish Khashshan in the Hariri rag. He did interview two pro-Syrian politicians but only to mock them. But in fairness: when he needed insights on Sunni public mood in Lebanon, he did cite the famous Sunni thinker, Michael `Umar Young (not to be confused with his Shi`ite twin brother, Michael Husayn Young).(p. 197). Even when Rafiq Hariri offers his hand to be kissed by his bodyguard (a well-known opportunist thug), it is portrayed by Blanford as a great act of generosity and kindness on the part of Hariri: "Hariri had sat on the sofa and raised his hand. [Yahya] Arab took it and kissed it. It was intensely personal moment."(p. 137). I mean, when I read that on the plane, tears started to stream down my cheeks. Were you not as touched as I was? (And Blanford who sometimes tells the same story twice in the badly edited book, tells the kissing-of-the-hand story twice). Why not thrice, Mr. Blanford. But worse, he dares to mock a Syrian demonstrator for allegedly holding a sign in English upside down (p. 160). Let me tell you, Mr. correspondent of the White Man. That Syrian worker you mocked, I am sure, has a better command of English than your (lack of) command in Arabic. Let me see you handle an Arabic sign. And I am sure that his Arabic is as good as your English, if not better (Syrian schooling really stresses Arabic unlike Lebanon). (And you mock the Syrian's English when you refer to Allah Akbar as "Akhbar"? Did you hear that on Israeli radio one day and it stuck in your ear? And you refer to mourning as "azar"? And you have the audacity to mock that Syrian worker? And Blanford (who under his name wrote about "tele-genic" March 14th demonstrators in a lousy MERIP piece after Hariri's assassination although he claimed (accurately) that the word was inserted by the editor as if this was the only problem with that article) is still impressed with the March 14th demonstrators. He cited a Lebanese man saying: "These aren't the $10 crowd. This is the bourgeoisie." Blandford was very impressed, and he adds: "Glamorous Maronite women, wearing chic black dresses, and sporting designer sunglasses, chatted in French and held aloft pictures of Hariri" (p. 146). And Blanford does not know that Hariri had any role in the UNSC 1559, which can only lead to one of two conclusions: 1) that he has not read the Western accounts and has not talked to people in Lebanon and outside of Lebanon who can tell him about Hariri's energetic role described in London Times among other places; 2) or he knows and is deliberately lying and covering up in the manner known for Hariri sycophants--and those sycophants are the only ones that he talked to, and whose accounts he reports UNCRITICALLY. Why not publish this book as a transcript of Hariri's entourage's conversations. But if you want a good laugh, you have to read his references to mini-Hariri. This is how mini-Hariri is described: "His mild-mannered, almost shy, persona, soft voice and quiet, self-deprecating wit could have been mistaken for insecurity, but Saad was no neophyte."(p. 168). But in fairness he does cite some of the aphorisms of mini-Hariri, and some are more profound than those of Nietzsche: "Politics is very difficult life."(p. 183) Or "My father served Lebanon all his life, and we will keep serving Lebanon also, like him."(p. 145) And everybody in March 14th, including right-wing zealots, fascists, and war criminals are simply described as "democracy campaigner." That is how he fondly remembers Jubran Tuwayni ,the notoriously sectarian and racist agitator who aligned himself with Saddam Husayn in 1990-1991. And this is Nayla Mu`awwad: "an energetic and attractive woman with a crown of Auburn hair." (p. 143.) As for the economic problems of Lebanon during more than 10 years of Hariri's holding the office of prime minister and controlling much of the government, well, he simply blames that on `Umar Karami who held the office of prime minister in 1991-1992.(p. 115). His term is, in Blanford's propaganda account, responsible for the massive debt and corruption of Lebanon. Well, corruption is no big deal for Blanford: he even justifies and dismisses the massive bribery by Hariri family in elections by saying "Vote-buying is a traditional feature of Lebanese elections..."(p. 227). And there is more, but I will save that for the full review. "Mr. Ban said Thursday that Mr. Siniora told him it was politically too risky for him to allow an Israeli writer into the country now." I saw this picture in the New York Times and felt ashamed that I complained last week about the DVD player in my classroom. "A ramshackle, overcrowded school near Kindu exemplifies the problems Congo faces in building a functioning government." "Except for a few brighter spots, the general trend from Morocco to the Persian Gulf has been towards a reinforcement of central control, a curtailing of public freedoms, and a fading of hopes for peaceful democratic change. Egypt itself, a country that is often seen as an Arab bell-wether, provides a useful example." "It is now absurd to expect Iraq to serve as a democratic inspiration—it has done more to inspire jihad." "In much of China, children in state care are given unusual surnames that clearly identify them as orphans. Common choices are Dang meaning “party” (the Communist one, naturally), or Guo meaning “country” or “state”. Those saddled with these names face a lifetime of funny looks, or a bureaucratic quagmire trying to change them." "N SECRET locations and using secret methods, human beings are scanning lots and lots of books for Google, the world's largest web-search company. That humans are involved is beyond doubt (fingers are visible in the corners of many pages on books.google.com) although this is uncharacteristic of Google, which has a fetish for purist technology. Google will not divulge exact numbers, but Daniel Clancy, the project's lead engineer, gives enough guidance for an educated guess: Google's contract with one university library, Berkeley's, stipulates that it must digitise 3,000 books a day. The minimum for the other 12 universities involved may be lower, but the rate for participating publishers is higher. So a conservative estimate has Google digitising at least 10m books a year. The total number of titles in existence is estimated to be about 65m."" News about "draft laws" in the sovereign (and unoccupied) country of Iraq: "The draft, which was released by the U.S. Embassy early Tuesday....Alaa Makki, a Sunni lawmaker who said he had not seen the draft..."
Where do they find those Arabs? When an Arab gets into Congress, or into a mainstream newspaper, lousy Arab and Muslim American organizations in DC find reason for celebration. Not me. Usually, I expect some token member on a rope. Look at this writer for the Washington Post from Saudi Arabia. "In his rare call for introspection in the Arab world, where conspiracy theories are common and many problems are blamed on Israel, Abdullah said..." First, what is this about "rare calls" for introspection? Are those calls common in the US? And to refer to King `Abdullah "introspecting" is akin to Mr. Bush thinking. And what is this inserted generalization about the Arab world? Like conspiracy theories are NOT common in the US? And this tendency to "blame many problems" on Israel. What is the evidence for that? Has she conducted opinion surveys? And other countries don't blame outsiders for their problems? And blaming some problems on Israel is not crazy or irrational at all. If anything, we need to blame more problems on Israel. And would she retain her job in the Post if she writes the same generalization about Israel? Faiza Ambah: I predict that you will make it in the US press. You may follow in Hassan Fattah's footsteps (your idol, maybe? ), and do a stint at the New Republic. 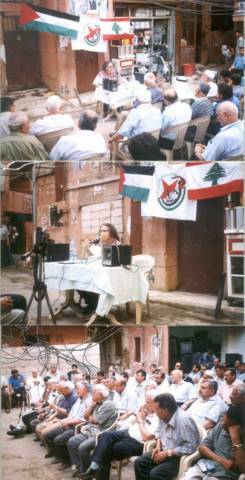 Raghidah Dirgham is a courageous Lebanese journalist. No, she really is. I mean, she writes for a Saudi newspaper but she is not afraid to praise the House of Saud. "Angry rhetoric in some Shiite Muslim mosques today blamed the United States for one of Iraq's bloodiest days in months, a pair of bombings Thursday that killed more than 125 people in a Baghdad market and a town north of the capital." "IDF widows' organization blacklisted minority members"
"Of all the foreign leaders President Bush has dealt with over the past six years, few have been as direct or blunt in private as Saudi Arabia's King Abdullah, according to U.S. officials. At one point in 2002, Abdullah showed Bush images of Palestinian children killed by Israeli troops and demanded to know whether he was committed to solving the Israeli-Palestinian conflict. Now, that private toughness has become public, just as Saudi Arabia has begun to play an uncharacteristically assertive diplomatic role in the region in an effort to calm potential flashpoints in Lebanon and the Palestinian territories. In a speech Wednesday before a summit of the Arab League, Abdullah decried what he called the "illegitimate foreign occupation" of Iraq and called for a lifting of the "unjust embargo imposed on the people of Palestine" that has been led by the Bush administration. U.S. officials said they were puzzled by Abdullah's description of the situation in Iraq and will demand an explanation. For months, U.S. officials have said that they were pleased by Saudi Arabia's willingness to shoulder a greater diplomatic burden, but Abdullah's remarks come after disquieting signs that Riyadh is distancing itself from the Bush administration." And this: ""We have a very good relationship with Saudi Arabia," State Department spokesman Sean McCormack said yesterday. "They're good friends and allies. President Bush and Secretary Rice have excellent personal relationships with King Abdullah, and we're certainly grateful for the hospitality that they have extended to us whenever we visit there."" Fatwawawa off the press. Yusuf Qaradawi has issued a fatwawawa forbidding lying on April Fools' Day. Please. 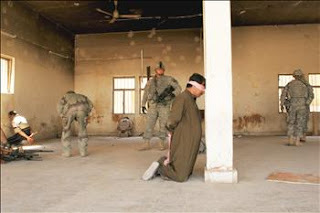 Don't think that the US has stopped "liberating" Iraqis. "Liberation" goes on every day. My mother was telling me about her opinions of the Arab summit. She said that she was happy about the Syrian-Saudi rapprochement but only because it will upset the March 14th people in Lebanon. She also praised Emile Lahhud. I asked her why she was praising him. She said that he was the only one in Riyadh who mentioned the Israeli war on Lebanon. The last group of people that I would entrust the Palestinian question with, are the Arab leaders. And they dare to speak on behalf of the Palestinians and their suffering. You look at them assembled, you listen to their speeches, and you tell yourself: not one of them--NOT ONE--deserves respect or admiration. If anything, they all deserve what they have earned: contempt from their populations. Please write it down on your calenders. Jalal Talbani has just realized that his country is under foreign occupation. He said that he has been in a coma and did not know what was going on around him. 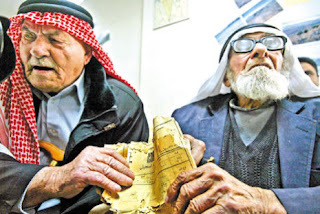 Land Day: Two Palestinian refugees in `Ayn Al-Hilwah camp in Lebanon showing the deeds to their lands in Safad in occupied Palestine. 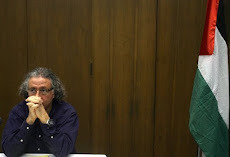 To the right is Fadil Taha (86), and Husayn `Ali `Isa (84) is to the left. (From Al-Akhbar newspaper). "This story, if correct, merits outrage on several levels. The killings described by Az-Zaman are reminiscent of the “raids” of Saddam’s army against rebellious cities. Ironically, the policemen who undertook the role of the “death squads” seem to be acting as a “militia among others,” as opposed to Saddam’s brutal apparatus of coercion. Tal 'Afar on Wednesday was a display of everything that is wrong with Iraq; and warning signs were ample: the sectarian agitation, the infiltration of security forces by militias, the state institutions that the political parties have parceled out among themselves, not to mention the ferociously sectarian, fanatical and violent political organizations that control political life in today’s Iraq; inside and outside the government." Now that Saudi-Syrian relations seem to be improving, you will see the results in the Saudi-funded Arab media. Suddenly, reports about Syrian human rights violations will disappear (not that Saudi Arabia is in a position to judge anybody); suddenly, `Abdul-Halim Khaddam will not find a place in Arab media to speak; suddenly, Syrian role in Lebanon will be praised; suddenly, reports of Syria's isolation will disappear. Hariri rag, Al-Mustaqbal, is already feeling the pain. Today, I could not find a reference to the (2nd) meeting between Bashshar and the Guardian of the Three Sites (two holy, and one IKEA store in the kingdom). Today, Al-Arabiya TV which specialized in airing embarrassing reports about the Syrian regime in the last two years, was leading with a sound bite by non-other than Bashshar Al-Asad, in which he says that he considers the Saudi summit as "the best" Arab summit in recent years. He also declared the Saudi weather as "the best" in the world. Bashshar added that the Saudi king is "the best looking" man he has ever seen. "West African child labour still feeds the world's insatiable hunger for chocolate"
"Female Islamist students wearing burkas raided a brothel and were holding the alleged owner inside their fundamentalist madrasa last night in the latest assault by extremists on President Pervez Musharraf's bruised authority." "But Rice will get no relief when she returns to Washington. She will have to deal with more depressing society news: Jordan's King Abdullah, who has spent more time in George W. Bush's Washington than any other foreign leader, has let the White House know that he can't make that state visit discussed for September. Can you do 2008? the king asks instead." "QUESTION: Another subject. The Arab summit just started in Riyadh and in his opening statement, King Abdullah made a very harsh comment on U.S. He said -- criticized particularly the illegitimate foreign occupation of Iraq. So I wanted to know if you have any reaction on that. MR. CASEY: Well, I've seen the press reports citing those remarks. Look, Sylvie, all I'd say to you is it's clear, I think, to everyone that the multinational forces are in Iraq at the invitation of the legitimate Iraqi Government and that that presence has been endorsed and given a mandate specifically by the UN Security Council and that that mandate has been renewed several times. So certainly there's no question in our mind that our forces are there in a legal and legitimate capacity in every sense of the word. And again, their objective there is to assist the Iraqi Government and the Iraqi people so that they will ultimately be able to manage security for themselves." 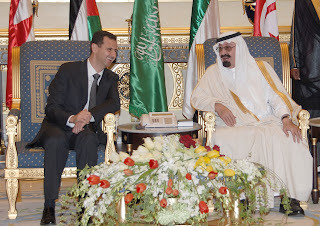 I read that Bashshar had another meeting with Saudi King. They may have reached an agreement. Make no mistake about it: Arab government never agree except in error, and always for sinister purposes, and always against the interests of their populations. Al-Akhbar's coverage is becoming increasingly sympathetic of Saudi Arabia. I need oxygen, I think. I watched a reairing of the interview with Mu`ammar Al-Qadhdhafi on Al-Jazeera. I still believe that he has not yet adjusted to his role as a new US puppet. I mean, in practice he is sticking to the role, but in rhetoric he still fluctuates back and forth. But in addition to all that--and I am always bothered that any foreign leader who gets in conflict with the US is immediately termed as "crazy"--Qadhdhafi is not altogether. He may need professional help, I mean that. I mean, he is so incoherent and inconsistent. He can start a sentence anti-Semitically, and then concludes it by declaring his sympathy for Jewish people; he can begin a sentence criticizing the Lebanese opposition, and concludes by identifying with it; he attacked the US, and then expressed his trust and faith in Condoleezza Rice. And he has no sense of humor; there is not one single Arab leader who has a sense of humor these days. I believe that Nasser had a sense of humor, as did Ahmad Shuqayri--politics aside. I think the host hated me. * I was on the NPR's To the Point Program talking about the Arab summit a few minutes ago. Prior to the segment, the host was talking to the London correspondent of the Economist (the best magazine there is), and he asked me: Is it not against the Geneva convention for Iran to show British sailors on camera? And then it was my turn, and he asked me a question about Saudi Arabia. I could not ignore what just happened. So I said: I could not help but listen to the previous segment, in which you asked about the Geneva convention. But I wonder: do American journalists notice the thousands upon thousands of Afghan and Iraqi prisoners paraded before the cameras by US occupation troops? Or does th Geneva convention apply only in some select cases? The host, I could tell, was not amused. I swear. This is why I don't like to do US media anymore. I get frustrated and upset. It is, I feel, unpleasant for me and for the hosts alike. PS * Maybe the host did not hate me after all. I received a call from him. ""The U.S. will use this summit to designate Saudi Arabia as the overall leader of Arab regimes," wrote U.S.-based Lebanese political scientist As'ad AbuKhalil on his blog site last week. "Instead of land-for-peace, it is peace-for-nothing, or nothing-for-peace," he said, depicting Arab governments, drained by years of conflict, ready to sign on the line at any price. "This summit will deliver the U.S. demands and conditions to ... a group of people who will not feel safe walking in the streets of their own capitals," AbuKhalil said." What went wrong, verge of tears, unmitigated disasters; is that all you have to say for yourself at this point? A smart intellectual with degrees as impressive as yours couldn’t figure out that the United States couldn’t logically want more good for Iraqis than it did for the Japanese it nuked, the Vietnamese it napalmed or the Palestinians, Lebanese and Afghanis it continues to oppress? Did you think every Iraqi would swoon at the smell of dollars and conjure grandiose Uncle Tom dreams of dining at the table with the slavemasters? If you genuinely thought that peace and democracy would bloom like a thousand flowers following the fall of Baghdad, you’re either seriously deluded or self-deceptive. What were you thinking? Were you trying to provide a live example of Badr Shakir Al-Sayyab's description of the invaders' shoes for literature students? And as if it’s not enough that you have advocated for a war that was so egregiously criminal ab initio, you then have the audacity to blame Iraq’s current disasters on Iraqi victims themselves, over red wine from the comfort of your Cambridge house? Albeit a cheap attempt to garner political leverage for her presidential campaign, even Hillary Clinton herself is apologizing. What makes you feel so smugly immune from guilt such that the pursuit of redemption is beneath you? While you, Mr. Makiya, and your gang of American-tank-riding thugs like Chalabi deserve to be tried for crimes against your own homeland, that’s not what I wish for you. I just hope Abeer Hamza’s ghost haunts you and that the echo of her screams play over and over in your head louder than the “music” that bombs on Baghdad were to your ears. If you have any remnants of a conscience, I hope it’s depriving you of sleep for the amount of Iraqi blood you have on your hands. Saddam Hussein himself would've been proud of you for trying so hard to find someone to fill his shoes after his demise. A fed up Iraqi reluctantly existing in the USA"
*In fairness to counterpunch, the author just informed me that Counterpunch also replied to her and ran it. "The Commission for the Promotion of Virtue and the Prevention of Vice in Saudi Arabia has presented training courses to familiarize 375 of its members with modern technology and the latest cyber culture to monitor any offences in this field. "The government spends more in welfare on the Jewish sector that it does on Arab citizens, even though the Arab population has a higher rate of poverty, according a report issued by the Sikui Association for the Advancement of Equal Opportunity on Thursday." Condoleezza Rice has the audacity to call on Arabs to "reassure" Israel. Yes. How can Arabs reassure the state with a massive arsenal of weapons of WMDs, and and which occupies Arabs lands? "An influential retired Army general released a dire assessment of the situation in Iraq, based on a recent round of meetings there with Gen. David H. Petraeus and 16 other senior U.S. commanders. "The population is in despair," retired Gen. Barry McCaffrey wrote in an eight-page document compiled in his capacity as a professor at West Point. "Life in many of the urban areas is now desperate."" "Shiite militants and police enraged by massive truck bombings in Tal Afar went on a revenge spree against Sunni residents in the northwestern town Wednesday, killing as many as 60 people, officials said. The gunmen began roaming Sunni neighborhoods in the city, shooting at residents and homes, according to police and a local Sunni politician." Ironies of "liberation": What do you do when the Ayatolluah's Republic next door is more open than your "liberated" country? I was reading on the plane the profile of Jalal Talbani by Jon Lee Anderson (from the Feb. 5th issue) in the New Yorker. A very interesting read but not sufficiently or nearly as critical as it should be given the opportunism of the man and his responsibility (along with Mas`ud Barzani) for the Kurdish civil war in the 1990s, in which some 10,000 were killed. But one passage really struck me: it was about a visit to Iran by Talbani and his entourage (accompanied by Anderson): "But what most caught the attention of the Iraqis was the large number of women and girls out on the street; the sight of women in public has become a rarity in Baghdad. A couple of the men in my car became rambunctious, taking snapshots of women with their camera phones." (p. 55). I fly either from Oakland airport or from San Francisco airport. Today, I printed my boarding pass at home, and drove to Oakland airport. I parked my car, and proceeded through security. The security person told me that my boarding pass says: San Francisco airport. I realized that I was at the wrong airport, and I had an hour or so for my flight. I drove fast to San Fransisco airport, and just made it on time. I explained to the airline person that in "Arab culture", it is common to confuse airports. He understood. He said that he had read that in Arab culture, it is quite offensive to throw shoes at people's faces. 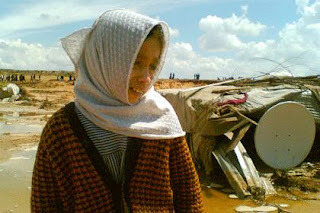 Israeli occupation forces destroyed her house. I do follow the Saudi media. This so-called Saudi source, for example, informed me that the Saudi King drank 14 cups of coffee today. Where else would I find such important information. The official Saudi greeting slogan on the occasion of the Arab summit (plastered in posters around the city) is: "Welcome to the country of peace and humanity". I kid you not, this about a country in which slaves are still being held by Saudi royals. How come we don't hear much about Prince Sattam bin `Abdul-`Aziz? I mean, aside from serving as the deputy to his brother the Prince of Riyadh--how cute. I saw many Arab leaders arriving to Saudi Arabia and greeting their Saudi hosts. None of them looked as pathetic, as submissive and subservient as Fu'ad Sanyurah, who when meeting a Saudi prince, acts like meeting his long lost beloved. Unlike all the other guest, Sanyurah first insists on kissing a Saudi prince at least three or four times and not two, and then insists on putting one hand (two when he kisses the King) around the neck of the Saudi royal. It is just his natural affection. "Many of the intellectuals and policymakers who supported the invasion of Iraq and theorized for the war have been backtracking in terms of their expectations of the new “democratic polity,” which the war, in their minds, was designed to create. Notably, the war's supporters (on the American and Iraqi sides) seem to have abandoned the idea that Iraq will follow the “German” or “Japanese” models, whereby an invasion by a “benevolent” democratic force will lead to the creation of a healthy and prosperous democracy, almost in an organic fashion, once the shackles of authoritarianism are removed." Ghassan Al-Imam on the political role of Sa`dun Hammadi. (The writer was a champion of Saddam before championing the Saudi King). ...off to Maryland. I am speaking Wednesday night at Washington College. Further information here. Returning Thursday night. The Mubarak Farce. Independent observers report a turnout of 2 or 3% in Mubarak's referendum, and the official Al-Ahram has this headline: "Mass showing that surpassed expectations in the referendum on the constitutional amendments: citizens ignore the calls by the opposition for a boycott." But then the same newspaper reports a turnout (in different regions) of: 20%, 21%, 24%, 29%, 40%, 23%, 35%, 29%, 30%, 20%, 20%, 15%, 25%, 21%, 55.6%, 60%, 19%, 30%, and 40%. So which is which, o Mubarak's mouthpiece? And the mouthpiece of the opposition party, Hizb Al-`Amal, got it all wrong. It claimed that the US expressed its "concern and disappointment." Let me tell you, o Hizb Al-`Amal. The US does not care about what Arab governments do to their people as long as those governments stay loyal to the US and continue to normalize with Israel. That's what matter for the US. Two new torture victims in Egypt. "With nearly two years remaining in his presidency, George W. Bush is alone. In half a century, I have not seen a president so isolated from his own party in Congress -- not Jimmy Carter, not even Richard Nixon as he faced impeachment." "Private businesses such as rental and mortgage companies and car dealers are checking the names of customers against a list of suspected terrorists and drug traffickers made publicly available by the Treasury Department, sometimes denying services to ordinary people whose names are similar to those on the list." "An inquiry concluded that the [Israeli] soldiers mistook Doaa [a 14-year-old girl] for a terrorist." The best commentary on Mubarak "constitutional" coup d'etat was a sign held by an Egyptian demonstrator which read "The Constitution of Abu Ghraib." (Would somebody find me a picture of that NOW). "The appearance of women in Emirates' public life has been prominent in recent years, and the government [of UAE] has been forward in giving strong push for the entry of women to the government, and then to the national council, and the question to be posed is to what extent the opportunity will be open before Emirates' women to play a political role in the Emirates' life?" Do you all now see why I have a chronic breathing problem? If you want to see men without dignity, self-respect, and pride watch Lebanese journalists around Saudi princes; if you want to watch men without dignity, self-respect, and pride, watch Arab officials around any US official. The chief of US propaganda at Al-Arabiya TV, the Lebanese right-winger, Elie Naquzi (who practically ran the TV campaigns of Iyad `Allawi--former puppet prime minister/embezzler-in-Yemen/Saddam's henchman/car bomber/chief-of-foreign operations for Saddam in Europe--) is preparing a special on US commander in Iraq. The station is running promos for the show at the rate of several times per hour--I kid you not. In the promos, the commander can be seen using the three words of Arabic that he has been taught. Saudi foreign minister rejected the division of Arabs into "moderates" and "extremists." He said, laughing, that Arabs are "one Arab nation, with an eternal mission", which is the slogan of the Ba`th Party. Saudi foreign minister called for "an end to foreign intervention" in Iraq. He meant--I kid you not--all foreign intervention except that by the US and UK. In other news, Rice considered public beheadings in the Kingdom as a sign of "reforms." Some humor for the day: "Alhurra has gained popularity by providing Arabic-language audiences with programming that cannot be seen on indigenous media, including shows dedicated to the rights of women, the democratic process in the Middle East and human rights abuses in the region. The network is also the place viewers turn to get more information on United States foreign policy, as well as discussion and varied opinions about that policy." " In her defense, the woman said she "was asked" to carry the crocodiles, said Wael Dahab, a spokesman for the Palestinian guards at the crossing." ""I've spoken about Ayman Nour at each time that I meet with my Egyptian counterparts," Rice said. "You didn't raise it today," Aboul Gheit gleefully interjected." To the left, is the secretary-general of the League of Arab States. Need I say more? In the last two days, Hariri rag, Al-Mustaqbal, has been running propaganda ads (but billed as articles) on its pages. This usually signals a new financial deal for the Hariri family in Tunisia. A religious site for Alawites in `Akkar in North Lebanon was set on fire yesterday. The area is loyal to mini-Hariri. Hizbullah displayed their misreadings of the Lebanese political situation yet again. Hizbullah's parliamentary bloc leader, Muhammad Ra`d, portrayed mini-Hariri as a helpless victim of Jumblat and Ja`ja` (Ga`ga` in Egyptian accent). Do they think that they are being smart or that they can avert Sunni-Shi`ite discord with that kind of rhetoric? And Ra`d even offered praised for mini-Hariri. Make no mistake about it: the Hizbullah-Hariri deal that will eventually come out, will be hell of a lousy deal. "Historically, the global balance sheet has favored poor countries. But with the advent of globalized markets, capital began to move in the other direction, and the South now exports capital to the North, at a skyrocketing rate. According to the United Nations, in 2006 the net transfer of capital from poorer countries to rich ones was $784 billion, up from $229 billion in 2002. (In 1997, the balance was even.) Even the poorest countries, like those in sub-Saharan Africa, are now money exporters." "Given her background in repressed societies, Hirsi Ali’s infatuation with the principles of Western societies — including gender equality, religious freedom, scientific inquiry and the rule of law — is easily understood." I have lived half of my life in "Western society" and never encountered those principles. What is wrong with me. But I will tell you this: "Western societies" seems really nice and perfect--at least from this letter. So Mr. Bush stands for "gender equality, religious freedom, scientific inquiry and the rule of law" and I have never noticed? Personally, I would rather be afflicted with malaria. She is translating the Qur'an although "[s]he does not speak Arabic." And Neil MacFurquhar decides to interview "The leader of the North American branch of a mystical Islamic order, Sheik Muhammad Hisham Kabbani." Kabbani is a graduate of AUB with a degree in chemistry. After Sep. 11, when he became a (buffoonish) cheerleader for Bush and his wars, Paul Wolfowitz invited him to the Pentagon (and presumably authorized him to issue agreeable fatwawawas) where he started speaking on Islam at right-wing fora and on right-wing shows like Michael Savage, where he and his religion would be mocked to the amusement of listeners. Oh, and Kabbani has one follower (counting himself). "For at least a year before the 2004 Republican National Convention, teams of undercover New York City police officers traveled to cities across the country, Canada and Europe to conduct covert observations of people who planned to protest at the convention, according to police records and interviews. From Albuquerque to Montreal, San Francisco to Miami, undercover New York police officers attended meetings of political groups, posing as sympathizers or fellow activists, the records show. They made friends, shared meals, swapped e-mail messages and then filed daily reports with the department’s Intelligence Division. Other investigators mined Internet sites and chat rooms." "A searing assault on Iraq's intellectuals"
"TIDE has also created concerns about secrecy, errors and privacy. The list marks the first time foreigners and U.S. citizens are combined in an intelligence database. The bar for inclusion is low, and once someone is on the list, it is virtually impossible to get off it. At any stage, the process can lead to "horror stories" of mixed-up names and unconfirmed information, Travers acknowledged." "And they call it peace: Inside Iraq, four years on"
Did you see the picture of the four Arab foreign ministers meeting with Rice? Did you see how happy and proud they looked? As if they won some international prize, or some very advanced blender. "Officials in the Prime Minister's Bureau refused to comment on Saturday on reports that Prime Minister Ehud Olmert met with a senior Saudi representative in recent weeks. Arab sources told Haaretz that Saudi Arabia's National Security Advisor, Prince Bandar bin Sultan, met with Olmert again in a follow-up to their previous meeting in Jordan about six months ago." "Mills received numerous messages of support and appreciation of his book. He was also criticized, insulted and threatened. According to the FBI, a few days following the appearance of Listen, Yankee, someone sent Mills an anonymous letter warning him that "an American agent disguised as a South American would assassinate him on his next visit to Cuba." In a memo dated November 29, 1960, the FBI noted that "Mills indicated he would not be surprised if this were true since he does not doubt that the Federal Bureau of Investigation and other similar United States organizations do not approve of his activities. Mills has made several inquiries in regard to purchasing a gun for self-protection." It is significant that the paragraph immediately following this quote is blacked out by the FBI and remains classified." Many in the Arab world--but not in the US--have been commenting on this unprecedented move by Rice when she summons Arab heads of intelligence services to meet with her during her Middle East tour. This is not the first time that she has done so. I don't think that there is even a precedent of a US Secretary of State meeting publicly with heads of Arab intelligence services. This is most suspicious. Call me conspiratorial--please, do; I mean it. It does not offend me in those times. The New York Times published this picture today with this caption: "Graffiti on the wall of a home in the Amil district of Baghdad reads "Wanted blood, Hell for infidels." As families begin to return to the neighborhoods they fled, the threat of sectarian violence remains." But anybody who knows Arabic will notice something really odd and fishy about the graffiti: It is not written by an Arabic speaker. 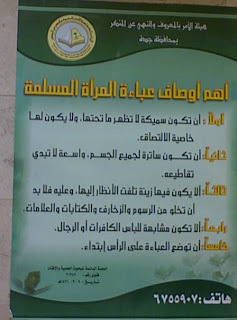 It does not read Arabic, and the basic words for blood and infidels are misspelled, and the sentence structure is wrong. As if it was written in another language and then google-translated, or something. "The U.S. military prison at Guantanamo Bay, Cuba, is likely to remain open for the remainder of the Bush presidency despite Bush's stated desire to close it, the administration said yesterday. "It's highly unlikely that you can dispense with all those cases between now and the end of the administration," White House spokesman Tony Snow said of about 385 prisoners currently at the Guantanamo facility. Asked directly whether the prison would close before Bush leaves office in January 2009, Snow said, "I doubt it, no."" "In supporting Mr. Sarkozy, Mr. Chirac may be motivated in part by self-interest. When he leaves office in May, he loses the presidential immunity from prosecution. He could face legal action — or at least the threat of it — over allegations that he was involved in a kickback scheme when he was mayor of Paris." That reminds me. Chirac was so sad when Rafiq Hariri was killed. They were "friends," you know. "The United States provided intelligence to the Ethiopians and sent in a small contingent of Special Forces ground troops after American officials labeled the Islamists a terrorist threat." "Shiite community leaders and residents in the neighborhood of the raid gave a significantly different account. They said American forces had stormed not one but two mosques, both linked to Moktada al-Sadr, the anti-American Shiite cleric. As the soldiers entered one of the mosques they opened fire on worshipers who tried to flee, said Salah Abdul Qadir, the spokesman for the Shiite Endowment, a government organization that supervises all Shiite mosques in Iraq." Yet another Israeli "explanation" of its humiliation in South Lebanon: "Restraint eroded IDF deterrence." Am I the only one who has not noticed Israel's "years of restraint"? "What won't the Shin Bet security service do to break the spirit of a Palestinian detainee? Before, interrogators used threats and told detainees that their loved ones were being arrested because of them. Now they even put on the show. Under false pretenses, agents brought the wife and the aged father of a security detainee to a Shin Bet interrogation facility, where they forced him to remove his kaffiyeh in order to humiliate him, then dressed him in a prisoner's uniform, held him by both arms and, through a window, displayed him to his son, who has been kept for weeks in isolation, without the opportunity to meet with a lawyer. The result: Prisoner M. launched a hunger strike. He has attempted to kill himself in his cell three times, twice by bashing his head against the wall and once by hanging." Apparently, Israel is only looking for love and affection: "Israel seeks friends through MySpace page"
I like it that the British government, in explaining the presence of its frigate in Shat Al-`Arab, said that the sailors and marines were on "a routine mission." Routine mission in the Gulf? You belong there? But the best defense of the presence of UK occupation troops was provided by the leftist Guardian: "The frigate HMS Cornwall is on patrol as the lead ship of Combined Task Force 158, whose UN-backed mission is to protect Iraq's oil platforms and exports against pirates, smugglers, and terrorists." How nice of them. I mean, people are being killed in Iraq, and the British troops found the time to protect oil facilities. How kind of them and thoughtful. So I wonder: can Lebanese or Egyptian troops protect British oil facilities too? The book is coming out soon. I have two chapters. It is already on amazon. (There are contributors with whom I strongly disagree, I should point out). I also would have named it "The Israeli War on Lebanon" but the choice of the title is not mine. Trying to reconcile religion--any religion, especially Christianity, Islam, and Judaism--with feminism is like reconciling smoking with good health. "Those poor Israeli occupation soldiers." Under this picture, the New York Times had this caption: " Israeli soldiers check the IDs of Palestinians at a West Bank checkpoint near Nablus, a task that troubles some soldiers." Those poor Israeli soldiers. 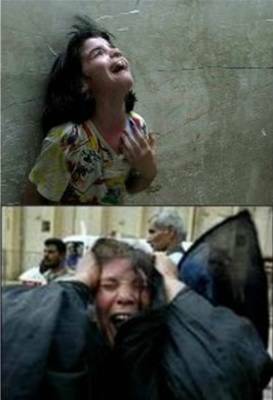 They shoot at little children. Those poor Israeli soldiers. They enforce a brutal occupation, and point their guns at toddlers. Those poor Israeli soldiers. They implement the racist rules of Zionism. Those poor Israeli occupation soldiers. Hariri rag, Al-Mustaqbal, claims that a French woman who was raped in Lebanon was raped "with her consent." They even put that in the headline. "Ms. Curry had accompanied Mr. Kristof on her first two visits to the region. “I was a little nervous about traveling with a hotshot anchor to a place that can be dangerous and difficult,” Mr. Kristof wrote. “We stayed that time in a little $4-a-night hotel, several people to a ramshackle room, with a pit toilet that was home to a bat that zoomed in and out at the worst moments.” “Ann,” he added, “put up with the bats, the scorpions, and of course all kinds of militias with guns.”" No, Mr. Kristof. That was not her biggest challenge. More than bats, scorpions, and militias with guns, she had to put up with you, and your boring ramblings during the trip. That must have been the worst part of her career challenges. I would rather travel with a talking potato, than with you, Mr. Kristof. No articles in the US press bother me more than those articles. Ever since I moved to the US, I came to realize that most of those who are critical of Israeli occupation (of only 24% of Palestine), do so not out of sympathy for the victims but out of love for the occupiers. Look at this in NYT: "Israeli Soldiers Stand Firm, but Duty Wears on the Soul." Notice that for American liberal Zionists like Friedman, the dispute with Saudi Arabai--or with any other tyrannical government is not about tyranny itself but it is all about...Israel: "If King Abdullah wants to lead — and he has the integrity and credibility to do so — he needs to fly from the Riyadh summit to Jerusalem and deliver the offer personally to the Israeli people. That is what Egypt’s Anwar Sadat did when he forged his breakthrough. If King Abdullah did the same, he could end this conflict once and for all." "Israel is gearing up for a diplomatic campaign that will paint the Arab world as the recalcitrant party if it does not drop the article in the Arab peace initiative that calls for the "right of return" for Palestinian refugees, The Jerusalem Post has learned." "Thirty-nine percent of Israeli Jews do not want Arab neighbors, revealed a poll conducted by the Israel Religious Action Center for Anti-Racism Day." "A total of 3,196 active-duty soldiers deserted the Army last year, or 853 more than previously reported, according to revised figures from the Army." "At least 150 people arrested in Kenya after fleeing violence in Somalia have been secretly flown to Somalia and Ethiopia, where they are being held incommunicado in underground prisons, human rights groups say. It is alleged they were questioned by US and British officials." "Taro Aso, Japan's foreign minister, risked upsetting his country's strongest ally by suggesting US diplomats in the Middle East would never solve the region's problems because they have "blue eyes and blond hair"." "The judge, Christa Datz-Winter, said the German woman of Moroccan descent would not be granted a divorce because she and her husband came from a "Moroccan cultural environment in which it is not uncommon for a man to exert a right of corporal punishment over his wife," according to a statement she wrote that was issued by a Frankfurt court. "That's what the claimant had to reckon with when she married the defendant." The 26-year-old mother of two had been repeatedly beaten and threatened with death by her husband." I swear. At that point, he was saying how impressed he was with the Maliki government. So Mr. Ki-moon. How did you find the security situation in Baghdad? I hear that the Bush plan is working, no? It seems that not only Fath in Lebanon is working with Hariri Inc. It seems that Hariri Inc also bought the Arab Liberation Front (a gang that was loyal to Saddam Husayn). The recent clash in Nahr Al-Barid camp was started by them, it seems. Please make sure that you always note this. The editor-in-chief of AlArabiya TV, Nabil Khatib, would like to only be addressed as Dr. Nabil Khatib. Personally, I think that AlArabiya TV also refer to `Abdullah as Dr. King `Abdullah. Some TV correspondents think that they can become good correspondents by dressing as correspondents, with a lot of pockets in their jackets. Personally, I like "relaxed grooming standards" for all. Hans Blix has courage. No, he really does. But it takes him around 10 years to muster his courage. Ghada `Id of New TV is in my estimation the most important journalist in the Arab world. We don't even have people with her courage and resolve anywhere. I wrote about her before and her show, Al-Fasad (Corruption). She exposes corruption in government with names and dates and figures. The other day, she focused on the Lebanese company Ojero, and revealed that a Hariri crony was being paid for overtime to the tune that he was ostensibly working 23 hours PER DAY. She often reproduces copies of checks on live TV. Some of the Western journalists in Lebanon should do a profile of her. I don't know her, and an American correspondent in Lebanon told me that she leans toward right-wing politics in Lebanese politics. But her work is most important. Nancy As-Sab` is a brave journalist for New TV. She interviewed the official in charge of "students" in Hariri movement, Nadir An-Naqib. She asked him how he can represent students when he has bodyguards, a driver, a secretary, and a special assistant has to answer his phone, etc. He said that it is important to find the killers of Rafiq Hariri. I am so dreading this. I am most dreading this. When the Arab summit convenes in Riyadh, I will be subjected to a barrage of Arab TV news coverage that will portray the Saudi King as "the wisest man on earth." The man who can't complete a full sentence, and who can't read a whole sentence without confusing words and letters and meanings, will be elevated to the status of prophets and philosphers. I know that during the Arab summit I will experience difficulties in breathing. I will need help NOW. Through European funding, Lebanese TV stations are running ads about the mistreatment of foreign domestic servants in Lebanon. Basically, they run like this: "be kind to your slaves." If I have the power to issue fatwawawas, I would certainly decree that banana cream pies be served at all road intersections, fresh. I saw an interview with Egyptian foreign minister on Al-Arabiya TV. The interviewer (the fine Cairo correspondent--her name escapes me now) asked me as to why the Egyptian government supports a plan (Bush's surge Plan) that is widely criticized here in the US. He said that it is due to the love exhibited by the Egyptian government for the Iraqi people, or words to that effect. He did not tell viewers about the love between Mubarak and Saddam for much of the 1980s. He only got critical of the US when she asked him about human rights. "Let them look at their own record", he said. Joshua Landis sent me a link to his response to Michael Young. It is too lame to post. Do you notice that many bloggers, especially academic bloggers, go out of their way to not offend anybody? Do you notice that Kuwait is being ignored from the list of reliable US puppet governments in the region? I wonder why the status of UAE (as a reliable puppet) is being elevated while Kuwait is being demoted. The Kuwaiti foreign minister has the same views of Michael Ledeen so I am rather confused about this. If anybody has information, let me know. I heard about some Kuwaiti-Saudi frictions but I don't know for sure. Bush Doctrine scores another quick victory; this time in Somalia. "Riyadh is now in its most splendid form." You hear this kind of language on Al-Arabiya TV (called "professional" by David Ignatius who does not know Arabic but he heard that on good authority). A puppet government spokesperson in Mogadishu called on citizens in the capital "to stay away from terrorists" because his government wants to "destroy them all." I kid you not (I saw that on AlArabiya TV). 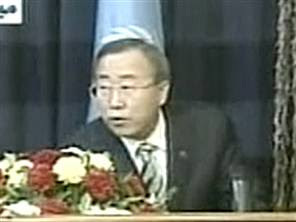 Ban ki-moon is visiting Baghdad. 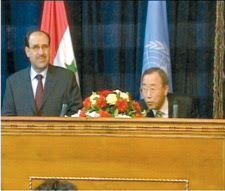 He pledged support for Maliki's government. In a very short period of time, ki-moon is proving that he is far more reliable than Annan, and that he stands on the same level with reliable US puppets in the region. "In the rapidly unfolding crisis in Pakistan, no matter what happens to President Pervez Musharraf -- whether he survives politically or not -- he is a lame duck. He is unable to rein in Talibanization in Pakistan or guide the country toward a more democratic future. Since March 9, when Musharraf suspended the chief justice of the Supreme Court, Iftikhar Mohammed Chaudhry, public protests have escalated every day -- as has a violent crackdown by the police and intelligence agencies on the media and the nation's legal fraternity." Mourning in the Jordanian royal family: the saddest day since the kingdom was founded. British press continue its extensive coverage of public beheadings in Saudi Arabia. Every day--almost every day, literally--you read in the Israeli press about a new excuse or a new "explanation" about why the "mighty" Israeli army was humiliated by 2400 Lebanese fighters in South Lebanon. Once, we read how the "three Iranian soldiers" in South Lebanon were responsible for Hizbullah's military performance, and now this: "Malfunctions in the transfer of supplies to the front was the main reason for the IDF's difficulties in the second Lebanon war, not a lack of supplies." If Arabs were not afflicted by their regimes--all their regimes--the Zionist regime would not stand a chance. "The Association for Civil Rights in Israel is calling on the Defense Ministry to examine the legality of preventing Palestinians from accessing Route 60, a main road in the southern Hebron Hills area of the West Bank. In a letter it sent to Defense Minister Amir Peretz, the ACRI argues that the Israel Defense Forces is illegally blocking Palestinian access to the road, thereby seriously impairing the freedom of movement of Palestinians who live in the area and impinging upon their civil rights." "U.S. to continue funding security forces loyal to Abbas of Fatah"
This is Zionism: "The Knesset on Wednesday voted to extend and widen the controversial Citizenship Law, which denies family unification to Israelis and Palestinians. The law, which was to have expired next month, will be extended to July 2008 and apply to citizens of the four "enemy states" - Syria, Lebanon, Iraq and Iran - as well as to those of the Palestinian Authority." Notice the ambiguous and convoluted language that Haaretz used to refer to a blatantly racist law that prohibits "mixing of the races" from the standpoint of Zionists. Lebanon is on the verge of civil war and the Lebanese police is busy uncovering a "lesbian network". The women were arrested but were later released after the intervention of a "religious authority" to avoid scandal.